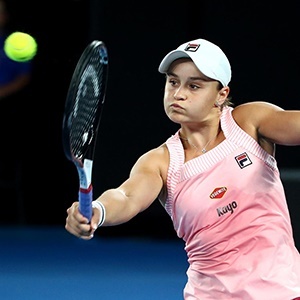 Miami - In-form Australian Ashleigh Barty moved into her biggest WTA final on Thursday, continuing her excellent run at the Miami Open with a 6-3, 6-3 victory over Estonia's Anett Kontaveit. The first ever meeting between the pair was frustratingly punctuated with lengthy rain delays, the longest of which lasted for over four hours. When the action finally got going, however, it was Barty who managed to keep her composure to get the better of an error prone Kontaveit. She will play either Simona Halep or Karolina Pliskova in Saturday's final and cannot wait to try and land her first WTA Premier Mandatory crown. The 22-year-old will move into the world top 10 when the new rankings are released and was delighted to wrap up this last-four encounter in just 77 minutes of playing time. "It was a very long day, I know we had to wait around but it was an opportunity to drink some coffee and watch the golf so I was relaxed," said Barty who took time out of the game in 2015 to play cricket before returning in 2016. "When I came out I was ready for business. I didn't start well but I was able to reset and do what I had to do." Having started this semi-final and quickly established a 2-0 lead before the first weather problems began, Kontaveit returned to Hard Rock Stadium's centre court only to be broken for 2-2. Then came more rain, and more frustrations for the fans and players alike. On resumption, it was Barty who wrestled back the initiative, making inroads on the Kontaveit serve to move 5-3 ahead. The Australian world number 11 was now firmly in control - she won 87% of points on her first serve which in turn ensured Kontaveit took just one of four break opportunities on offer in the opening set - and a double fault saw Barty move one set up. Barty's level noticeably dropped at the start of the second as 19th-ranked Kontaveit began to carve out opportunities to claw her way back into the match. One breakpoint went begging but when Barty double faulted for the second time in two games, Kontaveit had another chance which was sealed when the Australian hit long. The Estonian, however, was too inconsistent to keep the pressure on and a sloppy service game allowed Barty to draw level at 3-3. The final statistics showed Kontaveit won just 58% of points on her first serve compared to 83% from Barty. She was rushing through her shots and making too many errors - and coach Nigel Sears told her as much during a coaching break midway through the second set. Yet when Kontaveit was broken again for 5-3, Barty, who impressively beat world number two Petra Kvitova in the quarter-finals, held with authority to move into Saturday's showpiece.